Ah, Greece. The birthplace of democracy is an alluring travel hotspot for many reasons. The incredible history, beautiful landscapes, sun-kissed beaches, and mouthwatering cuisine make the Greek Isles one of the most popular cruise destinations in the world. While some cruise lines might simply add a couple Greek ports to their itineraries, spending a few hours in each, Azamara takes a different approach. We’re all about staying longer and experiencing more. So what’s the best way to experience more of Greece? Onboard a country-intensive voyage. These cruises focus solely on Greece, helping passengers truly immerse themselves in the destination. Our 2018 and 2019 country-intensive voyages to Greece call on some of the most popular Greek ports, as well as a few spots off the beaten path. Our ships often stay in port late into the night so there’s no need to worry that you won’t have enough time to experience all that Greece has to offer. To help you plan your Greek Isles vacation, we’ve highlighted seven things to do while you’re there. Visiting Greece is all about island hopping. Greece is home to over 6,000 islands and islets dotting the Aegean and Ionian Seas – though only 227 of them are inhabited. Island life is an integral part of Greek culture and mythology, and the best way to experience it is by cruise. Each Greek island has its own unique personality and flair. Cruising the Greek Isles is an enjoyable and convenient way to explore several islands. You can relax, unpack only once, and avoid the hassle of booking multiple accommodations and ferry trips. Sailing around the Greek Isles means your journey is just as pleasant as your destinations! What are the most famous Greek islands? Here’s a quick guide to ten favorites. If you ask someone what the best thing about traveling to Greece is, the odds are high they’ll say “the food”. Greek food is one of the most popular international cuisines and nothing beats the real thing. Real Greek yogurt is nothing like what you can purchase in a grocery store back home. This rich, creamy breakfast staple is usually served with locally produced honey and fruit or nuts. Fragrant olive trees are found all over Greece, even lining the streets of Athens. Olive trees symbolize peace and wisdom and hold great significance in Greek history and mythology. Today, olives and olive oil are fundamental parts of Greek cuisine. Greek cuisine features many kinds of cheese – halloumi, graviera, manouri, and kasseri, to name a few. But there’s no more popular or famous Greek cheese than feta. Order a Greek salad and it will come topped with a huge chunk of feta cheese. Phyllo pastry is filled with feta cheese and fried to make tiropites. Feta is baked into casseroles and meatballs or included in refreshing dips. You can’t miss sampling this key ingredient while in Greece. Dolmades are grape leaf rolls stuffed with a mixture of rice, pine nuts, and herbs. A gyro is a popular Greek street food. This pita is stuffed with meat that’s cooked on a vertical rotisserie (usually pork or chicken) as well as tomatoes, onions, tzatziki sauce, and often French fries. Grilled meat is a staple of Greek cuisine. Souvlaki is skewered meat that’s grilled and served with vegetables and pita. Pork is most popular in Greece, though chicken, lamb, and beef are also occasionally used. Varieties of this casserole-style dish can be found in many different world cuisines, including Levant, Turkish, Balkan, and Egyptian. Traditional Greek moussaka features layers of sautéed eggplant, tomatoes, and minced lamb. It’s baked with a béchamel sauce. This popular Greek dessert is a sticky concoction of phyllo pastry, chopped nuts, and honey. Of course, you’ll need something to wash down your food! Try locally produced wine and beer during your trip, as well as ouzo – the anise-flavored aperitif that’s very popular in Greece. On a hot day, cool off with a frappe iced coffee. When you cruise with Azamara, it’s easy to find an authentic food experience. Our travel experts have done all the legwork and research required to seek out the best spots. Food tours in places like Mykonos, Santorini, and Crete help guests to better understand Greek culture through cuisine. Many Greek cities are known for great shopping. When packing for your cruise, be sure to leave a little suitcase space for souvenirs! In Athens, you’ll find designer boutiques in the trendy Kolonaki neighborhood, while the Monastiraki neighborhood caters more to vintage, artsy, and bohemian styles. Leather sandals are a popular purchase – for years, the “Poet Sandal-Maker”, Stavros Melissinos, outfitted customers (including many a celebrity) with custom leather sandals at his shop on Theklas Street. His son, Pantelis, now runs the shop. Towns like Chania and Mykonos are beloved for their labyrinths of cobblestoned streets lined with shops selling clothing, carvings, cookware, souvenirs, art, and more. Santorini’s town of Fira is home to the famous “Gold Street” (officially named Ypapantis Street). It’s lined with high-end jewelry boutiques selling pieces in modern and ancient designs. It’s the perfect place to pick up a special memento from your journey. When you travel with Azamara, there’s no need to worry about where to shop. Our Cruise Global, Shop Local experts have curated a list of the best shops around the world – including plenty of destinations in Greece. If you’re looking for a sun-soaked vacation, there are plenty of options besides the Caribbean. In fact, Greek destinations like Athens and Rhodes are often named among the world’s sunniest destinations. A Greek Isles cruise offers up the perfect mix of culture and leisure. Be sure to devote at least one day of your trip to lounging on the beach! In Mykonos, Azamara guests can travel to the southern coast of the island and spend the day at beautiful Elia Beach. Soft white sand, the lapping sapphire waters of the Aegean Sea, and the warm Mediterranean sun. What more can you ask for? If you seek shade, rent a lounge chair and umbrella or grab a cold beer at one of the many beachfront taverns. Patmos is home to one of the best beaches in all of Greece, Kambos Beach, and it’s easily accessible via an Azamara shore excursion. This beach, located on the northeastern side of the island, truly offers something for everyone. Do you crave adventure? Try parasailing above the sparkling waters. Need a little rest & relaxation? Rent a sunbed for the day. Would you prefer to fit a little exercise into your vacation? The calm waters are perfect for canoeing. The beaches of Crete are unparalleled. Elafonisi, just a short drive from the main port of Chania, is famous for its photogenic pink sand and bright turquoise waters. Don’t forget to pack your camera for this beach day! The beach can be packed during high season (July and August). Our country-intensive voyages in October mean you get to enjoy the pleasant weather and lessened crowds of shoulder season. The volcanic island of Santorini is home to some of the most distinctive beaches in Greece. Though they don’t boast the soft, white sand of beaches like Elafonisi or Elia, Santorini’s rocky shores offer a unique appeal. Arguably the most famous is Red Beach, named for its position below steep, red, rocky cliffs. It’s only a short walk from the Akrotiri archaeological site and is well worth the hike for the photo opportunities alone. Of course, Athens offers more than ancient history. It’s a modern city with great food, shopping, and a lively, bustling atmosphere. After you’ve explored Athenian history, visit the epicenter of contemporary Greek politics at Syntagma Square. It’s located in front of the Old Royal Palace, which has housed Greek Parliament since 1934. Here, you’ll see the Tomb of the Unknown Soldier, a monument commemorating fallen Greek soldiers. A special unit of the Hellenic army called the Evzones guard the monument. They don traditional uniforms and conduct an hourly changing of the guard ceremony, with a full ceremony on Sunday mornings. One of the best things about cruising with Azamara is spending more time in port than with other cruise lines. In Greece, this means getting to witness splendid sunsets and partake in the famous nightlife of the Greek Isles. A late-night departure from Chania, on the island of Crete, means you can enjoy a leisurely dinner onshore and cap off your night with a glass of ouzo – it’s all part of having an authentic local experience! Enjoy a view of Chania’s stunning harbor at sunset from the waterfront. In Santorini, grab a cocktail onboard the ship and watch the sunset as you sail off to the next destination. It’s an experience like no other. In Athens, find a rooftop patio with a great view of the Acropolis and watch as the sun sets behind it. Pro tip: If you have your heart set on catching the sunset, check the time in advance. It will happen quicker than you think! The island of Mykonos heats up after the sun goes down. A late-night departure means you’ll be there to experience it! For the best sunset views, make your way to Mykonos’s “Little Venice” neighborhood. The iconic windmills are even more beautiful at night. The vast history of Greece is on display everywhere you look. The country is home to stunning ancient ruins and fascinating museums that simply can’t be missed. This rich ancient history is integral to the country’s cultural identity. Although Athens is at the core of ancient Greece, there’s plenty for history buffs to see and do beyond the capital. These sites should be at the top of the list. The tiny, once uninhabited, island of Delos is easily visited via shore excursion from Mykonos and is a must for history buffs. According to Greek mythology, Delos was the birthplace of the gods Apollo and Artemis. It has been a shrine, a sacred treasury, and a commercial center. Today, it’s one of the most important archaeological sites in Greece. Visitors flock to Delos to see the sprawling ancient ruins, visit the onsite museum, and marvel at the wonder of it all. Patmos is reputed to be where St. John wrote his Gospel and the Book of Revelation, giving the idyllic island a special significance in religious history. A monastery dedicated to him dominates the island, looming high above the whitewashed hillside dwellings. The monastery houses manuscripts, relics, jewels, and other artifacts. Crete has a rich history unique to that of Greece, and it’s best discovered through a visit to Knossos Palace. One of the best ways to explore it is during an excursion from Agios Nikolaos, so an expert guide can provide information and insights – you’ll find little signage here. Though the palace is the site’s main attraction, you’ll also see baths, courtyards, frescoes, and more. During the same excursion, visit the Archaeological Museum of Heraklion in nearby Iraklio. Here, you’ll see an impressive collection of artifacts from Cretan history that will help add context to your experience. The island of Santorini is most famous for its breathtaking vistas and photogenic villages, but it's also home to an important archaeological site. Akrotiri is an ancient Minoan city that was destroyed during a catastrophic volcanic eruption around 1627 BC. It was later discovered, buried under volcanic ash, during excavations in 1967. Continued excavations and new discoveries make it one of the most exciting archaeological sites to visit. It’s been suggested that Akrotiri is the lost city of Atlantis, a fictional island referenced in the writings of Plato. Visiting Rhodes is like stepping in and out of a time machine. The city’s Old Town is one of the best-preserved medieval cities in Europe. Stepping beyond the double walls and moat, you’ll feel as though you’ve been transported back to ancient times. Stroll down the Street of the Knights, visit the Palace of the Grand Master, and see the remains of the Temple of Aphrodite. Then, travel back to modern day and visit Rhodes’ New Town, where cobblestoned streets are lined with designer boutiques and tourists gather at waterfront bistros and bars. Of all the travel destinations in the world, few are as universally appealing as Greece, and there’s no better way to experience it than on a cruise. 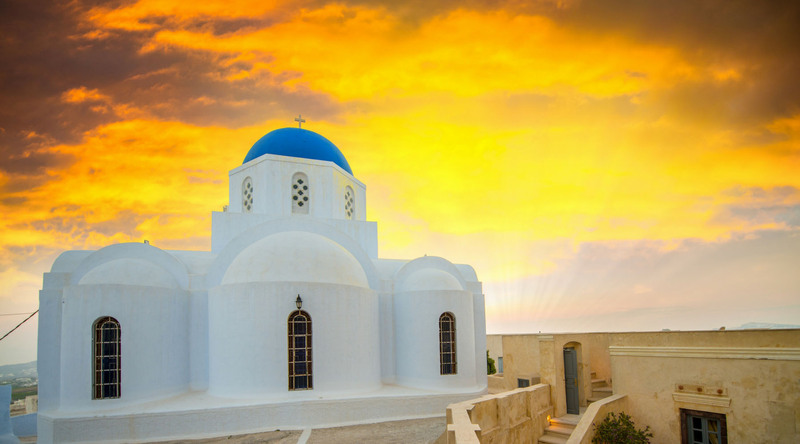 Are you ready to immerse yourself in the culture, history, and beauty of the Greek Isles? Join us on country-intensive voyages in 2018 or 2019, or browse all Greek Isles voyages here.